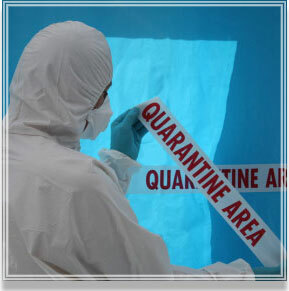 Because it is completely customized, the Infection Control Guide allows you to convey information specific to your organization's infection control policies and procedures. 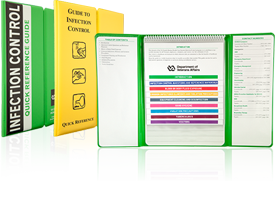 The product has a unique appearance so employees will have no trouble locating the Guide To Infection Control™ whenever they need refer to it. Because the information cards are in clear polypropylene pockets, you can easily and inexpensively update information as it changes. Just reprint and replace the one or two cards with changes as they come up, and your Guides are always up-to-date. 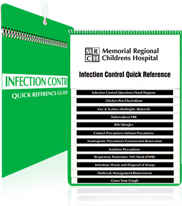 The Guide to Infection Control™ is a quick reference guide that helps keep your staff prepared for situations that call for quick implementation of safe infection prevention and infection control procedures. Working closely with you, our team of graphics coordinators will design the patient guide, organize and typeset the copy, and provide proofs for your approval at every step. We'll handle everything and deliver a finished product that is ready to put into service. It's that easy and always backed by our Plain Language Guarantee. The wall mount accessory ensures that the guide is readily available to your patients and their visitors.